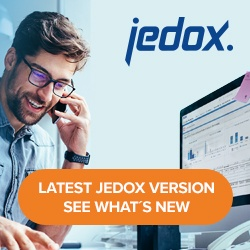 Both Jedox clients and offices are located all over the world. This requires a standard time format that can facilitate communication. We use UTC (Coordinated Universal Time) as a reference time format. The table below lists the time zones where offices are located and the time difference compared to UTC. Note: Most of these areas use Daylight Saving Time (DST). For some of them, DST does not occur on the same date every year. You can check the time changes of any specific city here. Freiburg im Breisgau, Germany CET/CEST UTC + 1h/ UTC + 2h during Daylight Saving Time. Frankfurt am Main, Germany CET/CEST UTC + 1h/ UTC + 2h during Daylight Saving Time. Düsseldorf, Germany CET/CEST UTC + 1h/ UTC + 2h during Daylight Saving Time. Paris, France CET/CEST UTC + 1h/ UTC + 2h during Daylight Saving Time. Bucharest, Romania EET/EEST UTC + 2h/ UTC + 3h during Daylight Saving Time. Boston, MA, USA EST/EDT UTC – 5h/ UTC – 4h during Daylight Saving Time. Melbourne, Australia AEDT/AEST UTC + 11h/ UTC + 10h during Daylight Saving Time. Sydney. Australia AEDT/AEST UTC + 11h/ UTC + 10h during Daylight Saving Time. To find out your time zone in UTC, use a time and date converter.